Tomorrow is June 30th, and it is bringing to a close the first month of business for Core Fitness and Nutrition. This is a journey that I started many years ago. There have been plenty of twists and turns along the way…..like most journeys, I thought I could have been thrown off course several times, only to learn that the roads I have been taken down were meant to prepare me for what was to come. When it came time to start to put all of my ideas into action this past year, the first step was to get it all on paper, and make a plan. Yes, a business plan. (Have you met me?) If you have, then you can begin to understand the magnitude of ME spending long hours and late nights doing research, crunching numbers, creating spreadsheets….UGH! But a necessary evil to get this plan up and off of the ground. I was fortunate enough to have the guidance and support of my family and friends….especially my husband who both insisted that I do this planning, and then sat in awe watching as I actually did it! Then came time to search for the perfect location. We spent weekends driving around looking for spots, and I put in a phone call to my trusted Real Estate agent to keep her eyes open for me. I explained to her that I needed a unique and beautiful location, and if she could find me something like 62 Main St. in Upton, I would be thrilled. (No lie, I said those things). Of course at this time 62 Main St. was unavailable. 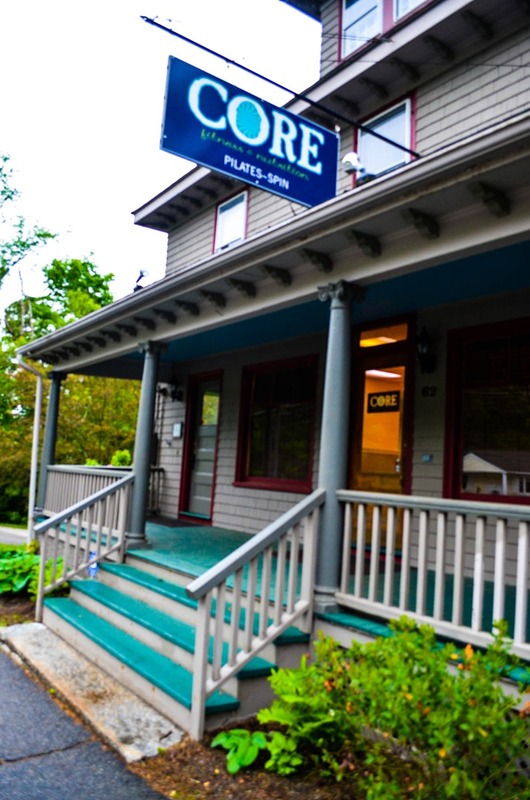 Eventually, I found a spot that would be suitable for Core in downtown Hopkinton. It wasn’t perfect, but we could make it work. We entered into negotiations, and were coming close to making a deal when I got the phone call…….. It was my Real Estate agent calling to give me the very first word that 62 Main St. was coming available NEXT MONTH! (Thank you Tina!!) How much better could this get? The rest is history. We signed the lease, and got moving getting the space ready for our new Pilates and Spin Studio. Now here we are, three weeks and one day into this adventure that has been a dream of mine for a dozen years. I love teaching people about fitness and wellness. It is such a large part of who I am. It is so rewarding to be a part of peoples transformations. To get to know each and every one of my clients and students, and watch them grow and become stronger is a privilege that I am thankful for. Now to be surrounded by my wonderful team of instructors (Sharon, Rick and Rebecca, Thank You for starting this journey with me!) and my long time clients who have become like family to me (you know who you are, and I love you!). And last but not least, the wonderful new clients and students that have become part of our team. I am looking forward to watching you succeed as we all move forward to grow and build a larger community of support and encouragement for people to come and realize their true potential!